Comments: A high-end market Point de Gaze fan leaf with multiple raised petal roses. Note the clothwork used as fillings in a striped pattern which is unusual. Good decorative ‘mode’ fillings, I especially like the grids of knots. Naturalistic floral design, well advanced from the more conventional raised petal rose motifs. Damage: Scattered small holes and pinholes in the mesh. Some small repairs. Sold for $107.50, 3 bidders. 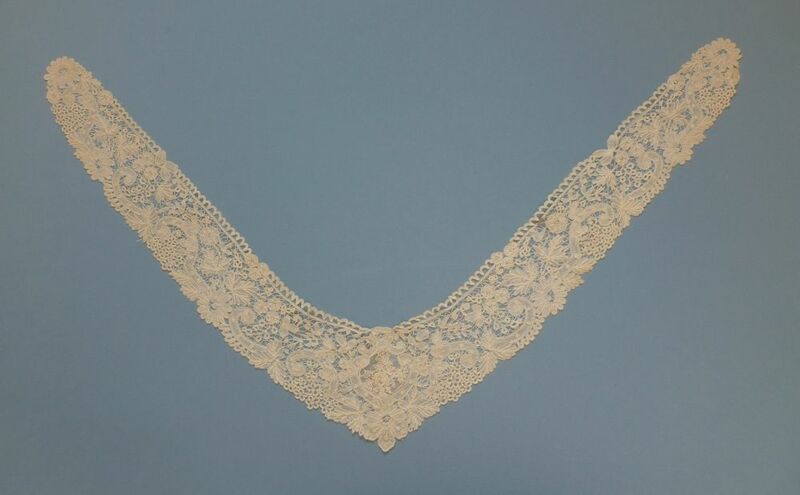 http://tinyurl.com/zxxuw9k An exquisite Antique Brussels Lace Bertha Collar C. 1890. Size: 18 to 18.5 cm deep x 60 cm wide. Comments: These two are an interesting comparison so I’ll review them together. 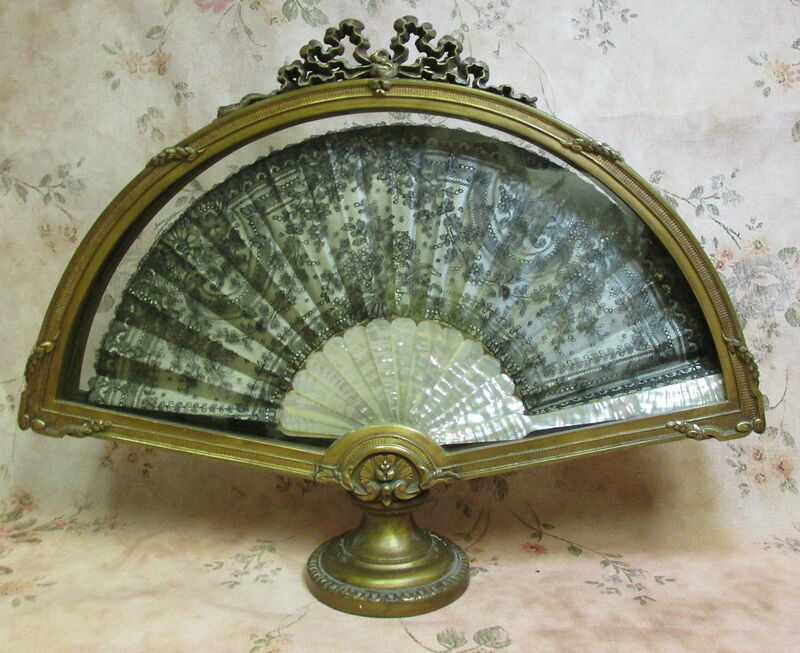 The first is a Duchesse de Bruges piece, I think it is a fan leaf. It doesn’t seem circular enough to be a collar. The second one is a deep collar, much the same design as the first, but it looks like it is largely made of pre-made tape, more along the Princesse line. 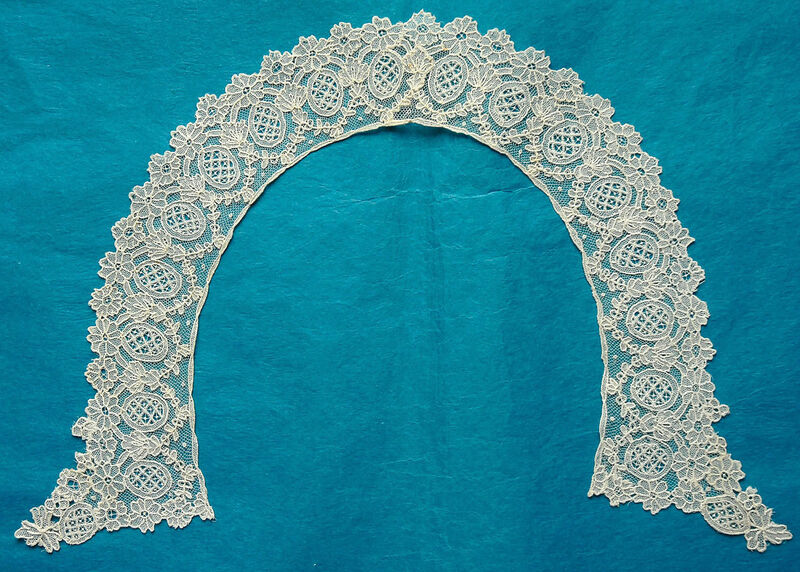 The first is a good example of middle-market Duchesse design, a staple of many lace manufacturers. 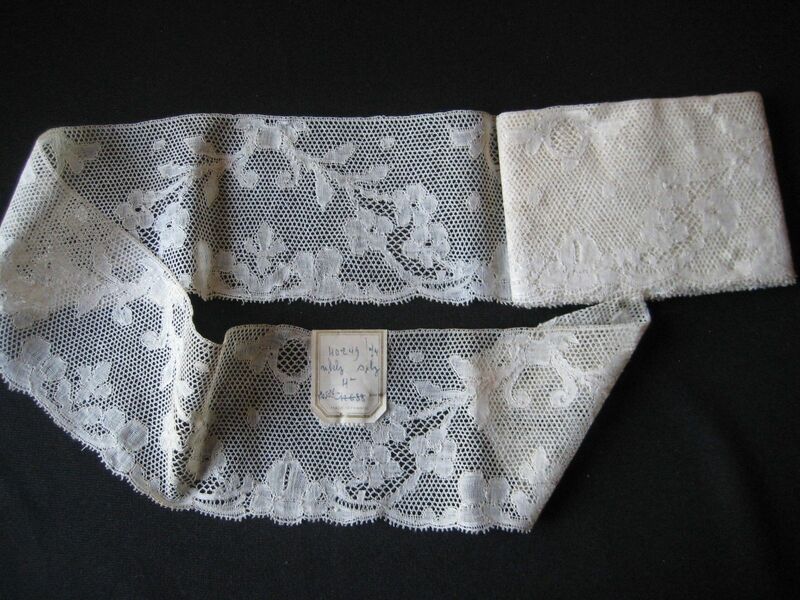 It’s not surprising that manufacturers would seek to imitate it with a more tape-lace technique. Modifications: None on the collar. I am questioning the fan leaf edges – one doesn’t look completely finished, but not really cut off. The other edge looks like something that would go on a guardstick. Damage: Nothing obvious from the photos on either. Finish: Vertical fold creases on the fan leaf. The collar looks slightly shrunken, perhaps from washing or just the limitations of the technique. Size: 14 cm deep x 103 cm long. 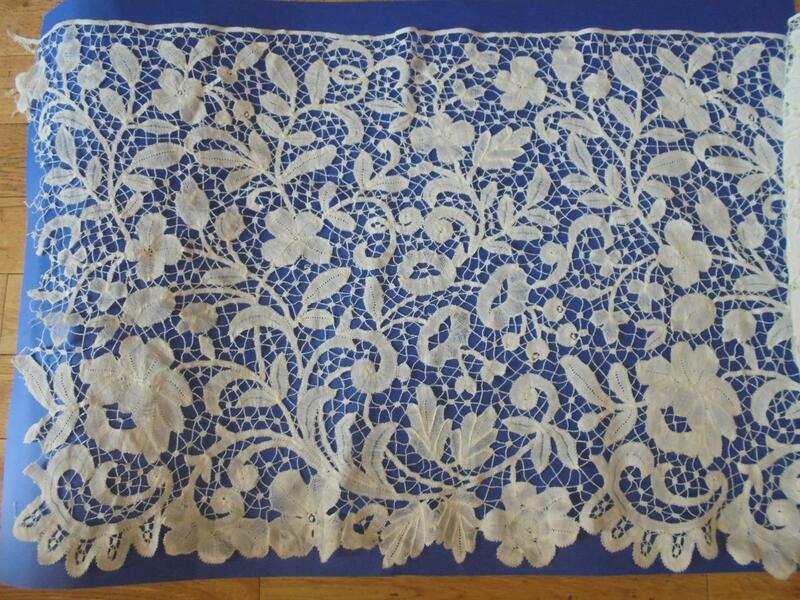 Comments: A Bertha of Brussels bobbinlace applique on machine net. It has a very light design with small circular esprits in the ground. Decorative ‘mode’ fillings of alternating needle-made rings and knots are used in flower centers. A good middle-market product. Damage: One small hole along the neckline. A few stray threads on the outer edge. Finish: Vertical fold crease down the center. Some light creasing. Comments: A Brussels Duchesse border with an elegant Point de Gaze flower with raised petals (not a rose) worked directly into the pattern with no ground mesh. Needle-made rings are used as fillings in both bobbin and needlelace. Irregular picoted brides. The design is a short repeat with interesting floral and leaf work, well beyond conventional Duchesse. Modifications: Ends cut, engrelure added. Damage: One defect in the header. Finish: No obvious creases or winkles. Comments: A long square-mesh Valenciennes border. It has a short repeat of a tulip-like flower, with small buds and dots used as esprits in the upper ground. No ombré work. 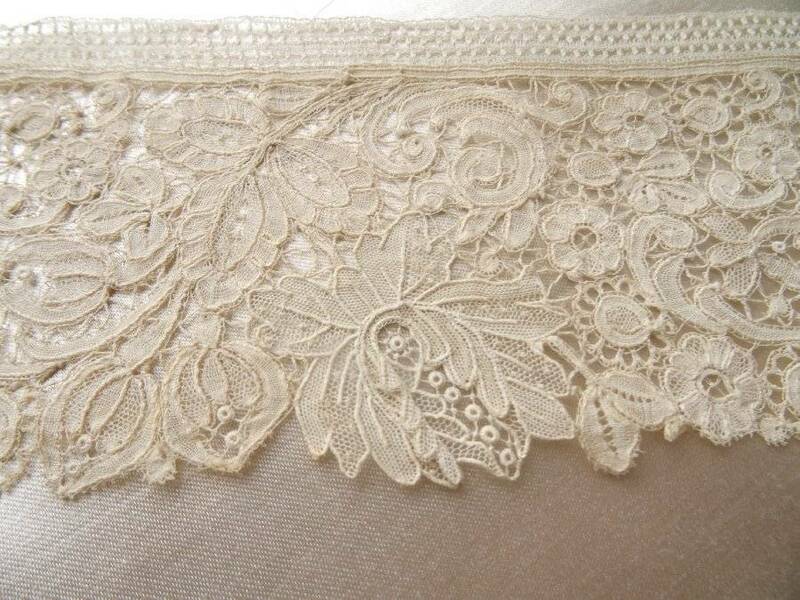 This type of lace as used extensively as edging for linens and nightclothes. Modifications: Cut into three pieces, engrelure added. All ends cut. Damage: Occasional broken mesh leg. Soilage: Some small, localized tan spotting. Finish: Soft vertical fold creases. Sold for £23.00, 6 bidders. Comments: An elaborate 19th or 20th century Gros Point interpretation. Note the tightly covered sculpted raised cordonnet, and the varied clothwork. I’m guessing Italian, but it is very difficult to attribute origin to pieces like this. Other possibilities include Ireland, Belgium, France, and Austria. A definitive identification work on the subject is badly needed (notwithstanding the conference on the subject held at the Textile Museum in St Gallen in 2011 – interesting but it didn’t solve the problem.) This piece is quite exuberant and has a lot of life mainly due to the varied types of clothwork. The sheen of the thread looks like linen, but hard to tell from the photos. Provenance: Private collection of a large estate. Damage: Occasional fraying in the raised work. Soilage: A few brown storage marks. Sold for £85.00, 7 bidders. 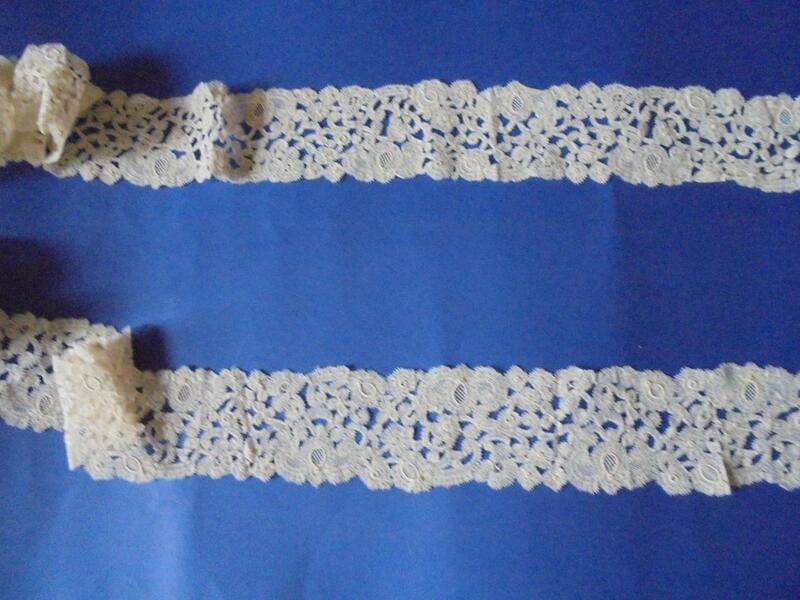 Comments: A long wide pieced bobbinlace that I think is a Bruges product. It isn’t the typical Bloemwerk – there is no gimp and the motifs are large and a little blocky. There is some halfstitch shading, but the main ornamentation are the center veins of petals and leaves which give some direction and definition to the clothwork. Given the scale of the work I think the motifs are larger than they look in the photos. It is a sign of good design when something like this can look good in both a large and small perspective. Note the ‘islands’ in the middle of the irregular picoted brides, which you do find in Bruges work. Modifications: Cut one end, can’t see the other end. Sold for £563.00, 9 bidders. 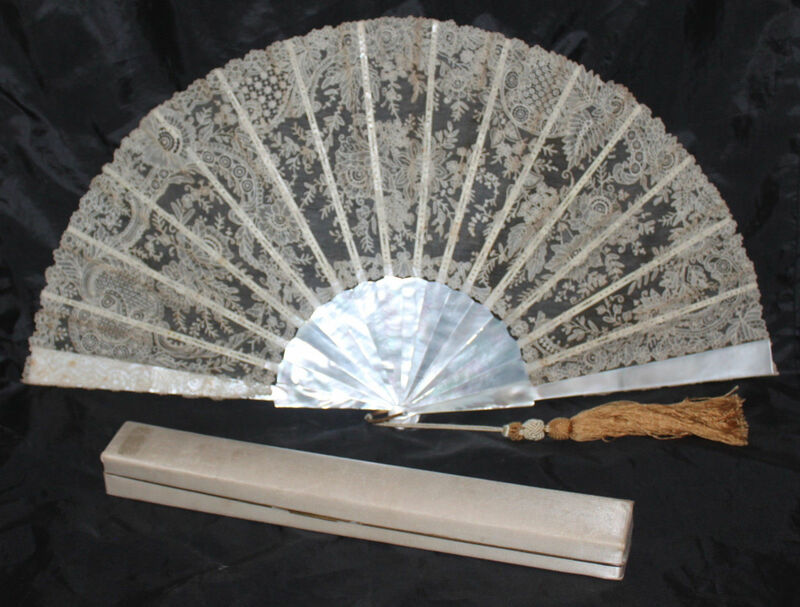 Comments: A high-end market Point de Gaze fan, no raised work, with Mother of Pearl sticks. 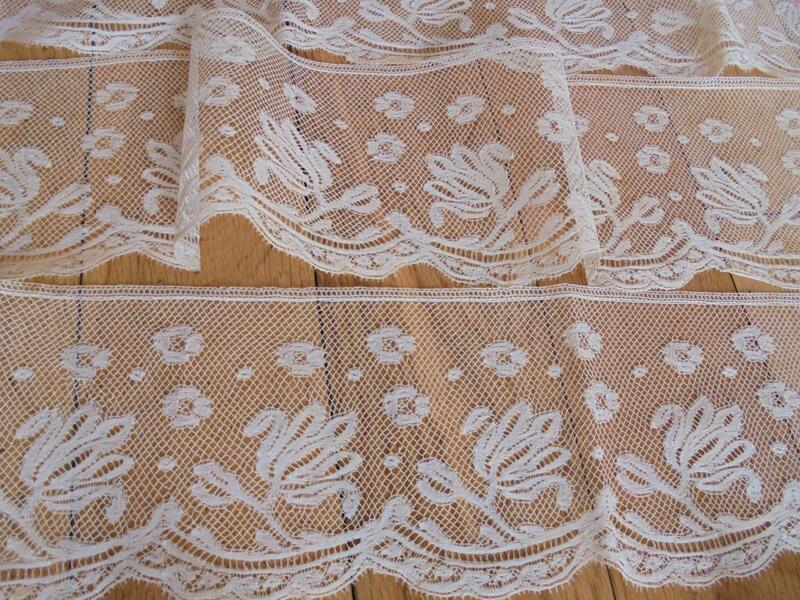 The lace is of such high quality that I’m surprised they didn’t use something more elaborate in the sticks. The design is quite naturalistic with extensive decorative ‘mode’ fillings, especially the little circles and knots in the grid pattern. Comes with original box labled “Madame Mercier, Trousseaux, Bas de Luxe, Dentelles & Eventails, 26 rue Mather, Paris. The tassel has also survived. Provenance: This comes from the collection of Francis Maude McCray (1892-1976), the wife of the Chairman of the New Bedford Edison Electric Co. in Massachusetts. They had no children and Mrs. McCray was a collector of American furniture, fans, calling card cases, and Chinese export items. Most of her collecting was done from the 1930s through the 1950s. The fans and card cases were left to her niece and they have been in storage since then. Damage: Nothing obvious from the photos. Pt d G mesh looks good. Soilage: Brown staining primarily where attached to the ribs. Sold for $305.00, 8 bidders. 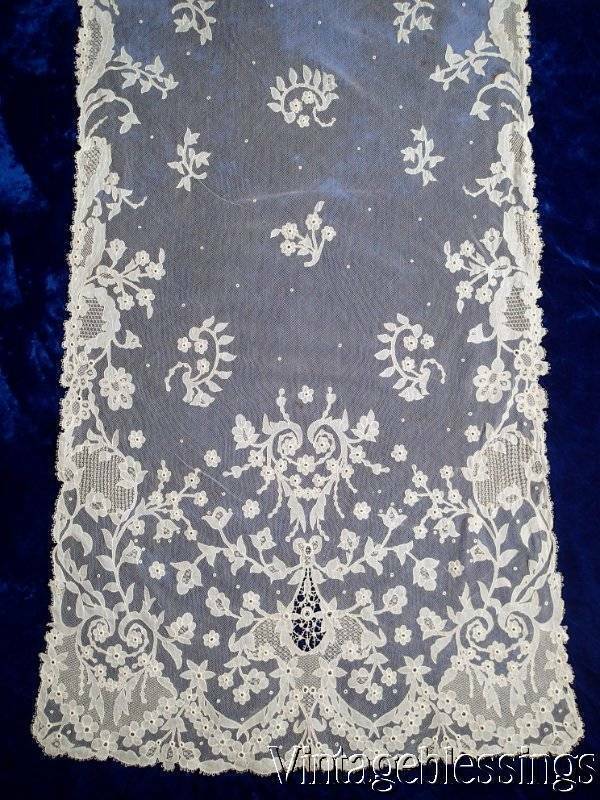 Size: 20.5″ across (not sure if that’s the frame or the lace). Sticks are 11″ high. 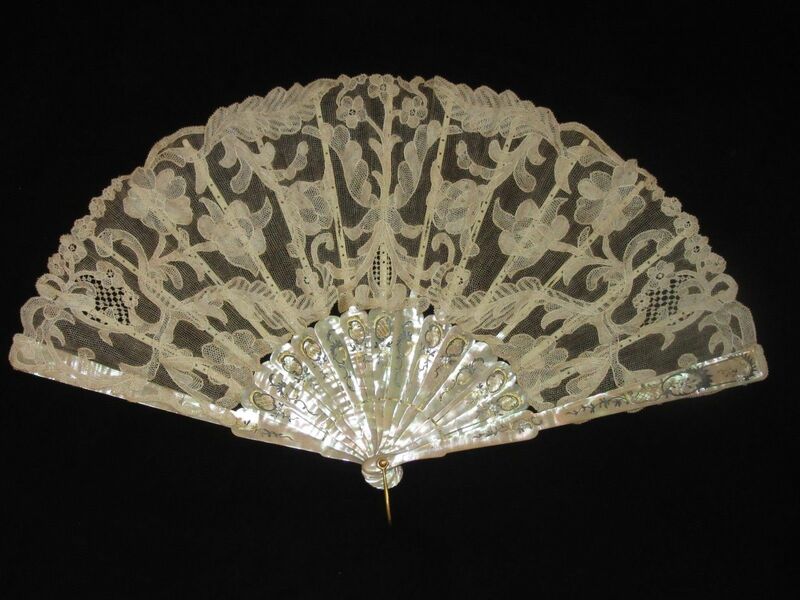 Comments: A Chantilly fan with Mother of Pearl sticks in an elaborate standing frame. The lace is back with silk. 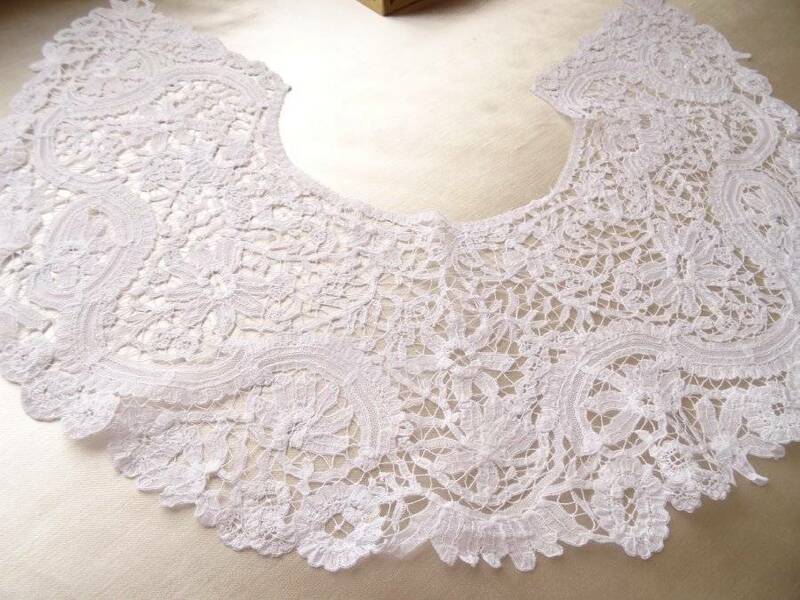 The lace design is typical romantic florals and swags, not too elaborate. The fan doesn’t quite fit in the case, so the left hand guard stick is not visible. 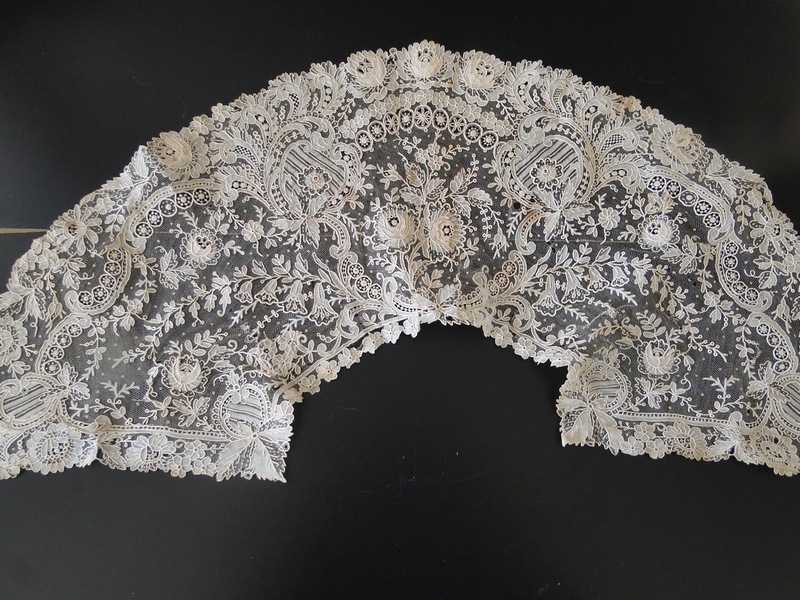 Damage: Nothing obvious from the photos on the lace. Some splits in the silk lining. Soilage: There might be some brown spots where the right hand guard stick is attached to the lace, hard to tell from the photos. Sold for $380.00, 3 bidders. Comments: A heavy silk guipure triangular dress front with attached choker collar. ‘m reasonably sure these are two separate pieces. Note the very dense leaves sometimes raised against halfstitch ground, also the heavy gimp thread around some motifs. I’m thinking this is a French Cluny piece, perhaps from Brioude. Damage: A little worn around the neck edge.Gimp is loose in one place. Soilage: Seller cites a rich cream color. Looks clean. Finish: A little wrinkled around the edges, especially the neckline. Seller says it is intact. Sold for £17.60, 3 bidders. Comments: A long collar of Brussels Duchesse with a raised petal rose in the central Point de Gaze insert. Naturalistic floral design – I like the interruption of the neckline pattern with flowers and leaves. Some raised work in the bobbinlace on halfstitch backing in the scrollwork. 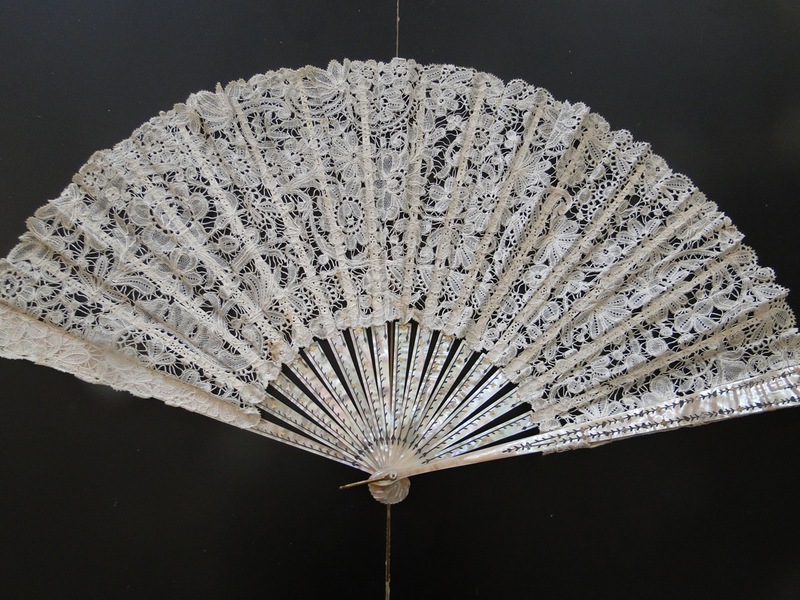 Damage: A few frayed brides in the bobbinlace. The Point de Gaze mesh has been replaced with a tulle backing. That whole insert looks a little messy. Soilage: Isolated brown spot along the neckline. Sold for £23.00, 3 bidders. Comments: A long border of Irish Youghal needlelace. 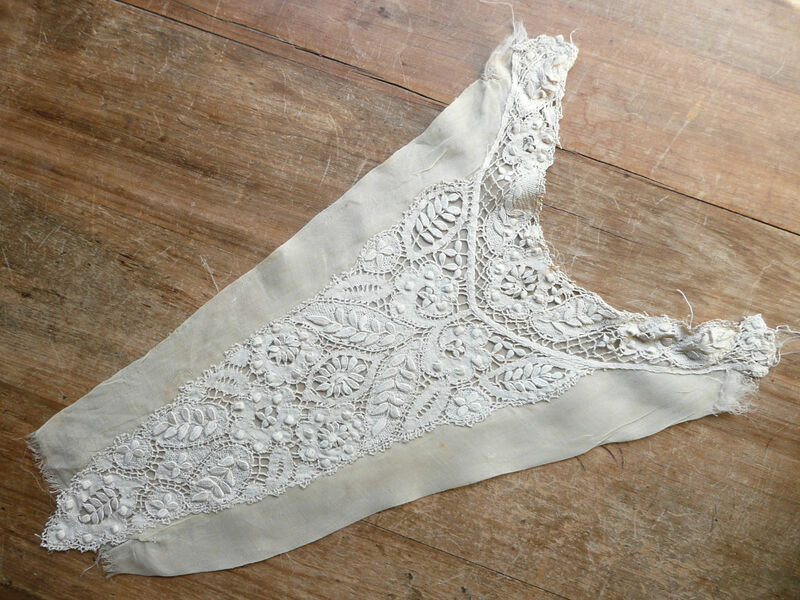 Everything about this piece is classic Youghal, from the scalloped foot edge to the very interesting filling stitches and the picoted brides. The repeat is short with flowers and leaves including windows in the cloth stitch and ring decorations against the more open work. Excellent example of the type. Modifications: Seller notes that one end is finished, the other cut. Damage: Occasional minor pinhole in the clothwork. Soilage: Seller cites “antique white colour”. Comments: A insertion of Belgian Rosaline Perlé. I think the perls here are needle-made, and that same kind of raised work also extends into some of the flower centers. Note that there are needle-made fillings in a few motifs, which is unusual. Most Rosaline has a bride background, but there is a second time without brides as in this example. 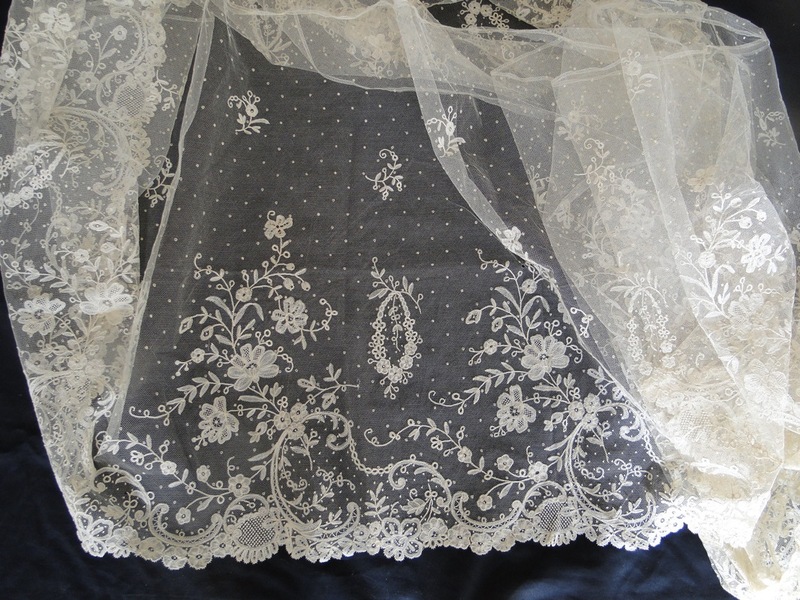 This later 19th c lace is one of my favorites, especially the ‘bride-less’ kine which has an unusually clean appearance. Provenance: From the private collection of a large estate. Modifications: One end looks finished, can’t see the other end. Finish: A few irregular fold creases. Sold for £29.55, 7 bidders. Comments: A crinoline flounce of Brussels bobbin-and needle-lace applique on machine net. There are some small decorative ‘mode’ needle-made fillings, along with a large hexagonal motif and leaf spray along the lower border completely needle-made. This piece has an elegant romantic floral design with a short repeat. Carefully drawn naturalistic flowers and leaves of excellent technique. Note the small esprits in the rest of the ground. What is most unusual is that this appears to be the end of a much longer piece, and one end is just plain tulle, never having been embroidered. Modifications: One end cut, the other end was never appliqued. Sold for £185.00, 8 bidders. Comments: A small Point de Gaze collar. No raised work, and the design is a short repeat, mostly florals. A simple elegant piece, although quite small. Soilage: Seller cites soft ivory color. Sold for £21.00, 2 bidders. 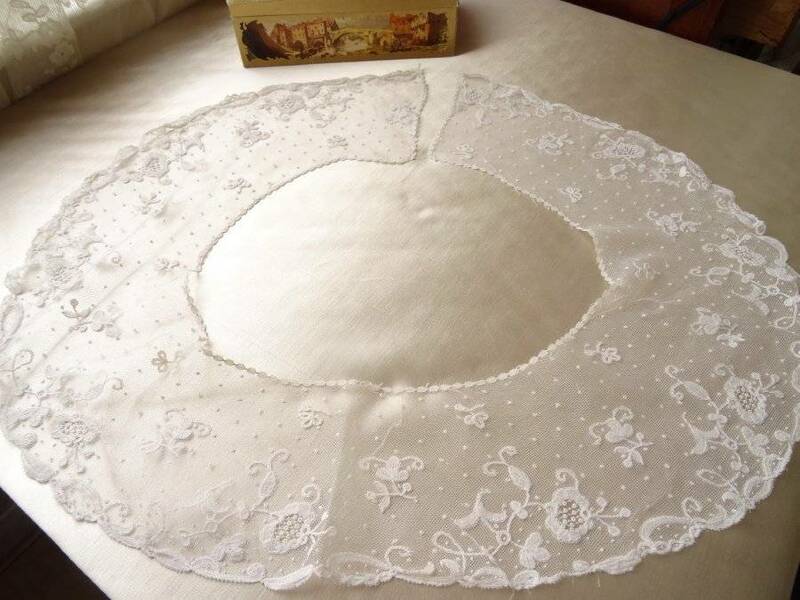 Comments: I don’t often review table linens – there are plenty of these on Ebay and the needlelace ones don’t often deviate from one or two basic designs. This one is more adventurous showing an elaborate hunt scene. No napkins or other set pieces. It might be Italian, but it’s often hard to attribute a place to pieces like this. Soilage: Seller cites light ecru color. Seller says it has been ‘carefully hand laundered’ but gives no details on the process. A few faint discolorations remina. 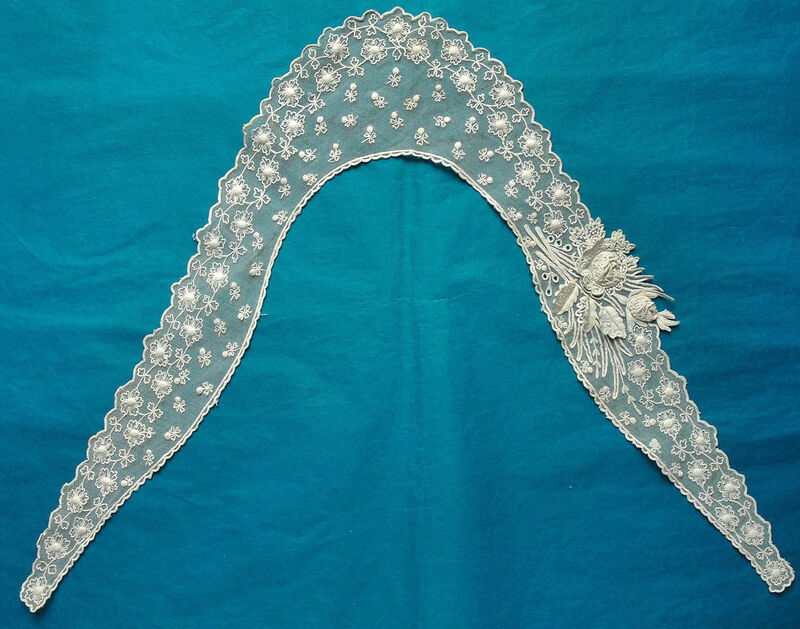 Comments: A Brussels Duchesse deep collar, and there is one raised petal rose at the back of the neckline, the rest of the Point de Gaze inserts are flat. Note the elaborate decorative ‘mode’ fillings, especially the grid arrangements. It has an elaborate romantic floral design. Provenance: I spoke to the seller about this piece, it was purchased by her mother who got it at an estate in San Francisco. 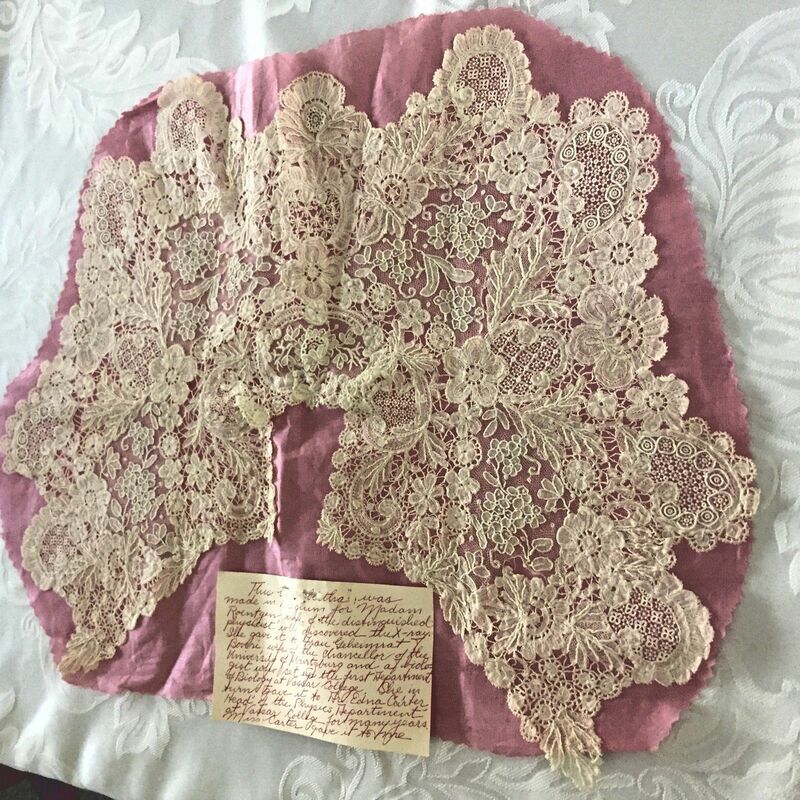 The cloth is signed by E. G. Nelson on the back, who according to the note was the last owner documented in the attached note. The note gives the history of the piece back to Mme. Roentgen, although no dates are given. Date: The Roentgens were married in 1872 and this piece is consistent with the 4th quarter of the 19th c.
Modifications: None. Piece is basted onto fabric. Damage: A few separations of the Point de Gaze from the bobbinlace. Soilage: Looks a little beige in the photos. Finish: Fold creases, and the pieces has been fit so it lies flat on the fabric. The motifs seem a little shrunken, probably from a past wash.
Sold for $305.00, 4 bidders. Welcome to Los Alamos, Mme Roentgen! Comments: A Point de Paris border, of the type we often see originating around WWI. The tag appears original and says ‘Made in France”. It has a simple, elegant design with a curving trail and restrained florals. 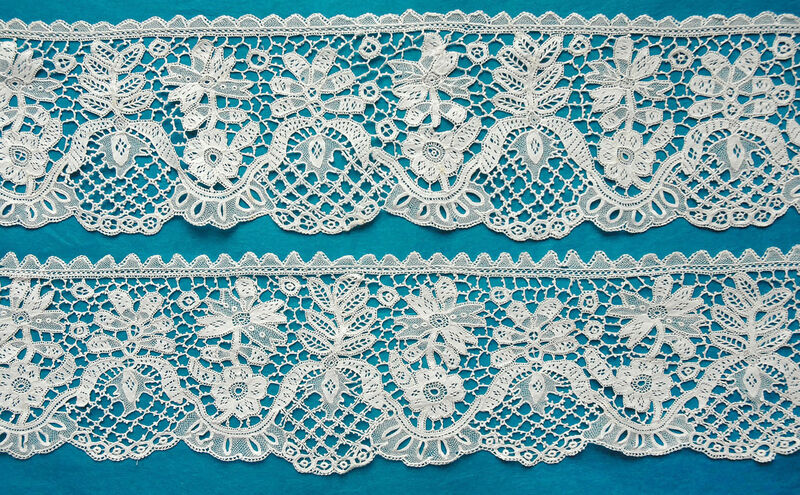 I think someone should investigate the connection of laces like this with earlier Pottenkant designs – many of the techniques are similar. Modifications: None. Can’t see the ends to tell if they are cut. Soilage: Seller cites a light ecru color. Finish: Vertical fold creases. Looks unused. Sold for $72.00, 2 bidders. Comments: A triangular Chantilly shawl. Typical romantic floral design but not overly elaborate. No esprits, and no ombré shading. Damage: Holes along the top edge. Racroc split along one side. I think there might be one repair near the right point. Difficult to evaluate since it is photographed on the rough texture rug background. Soilage: Looks clean, but hard to tell with black lace. Finish: Irregular creases in the body of the piece. Sold for £104.00, 4 bidders. Size: 34″ neckline, 4″ back depth. Comments: An interesting embroidered net collar with long points. Most of it is a very dense tambour with some padded flower centers. Looks like the edges are crocheted. Then there’s this large raised embroidery rose motif attached to one side. It makes quite an impression. Soilage: Seller cites a pale ivory color. Sold for £47.10, 3 bidders. 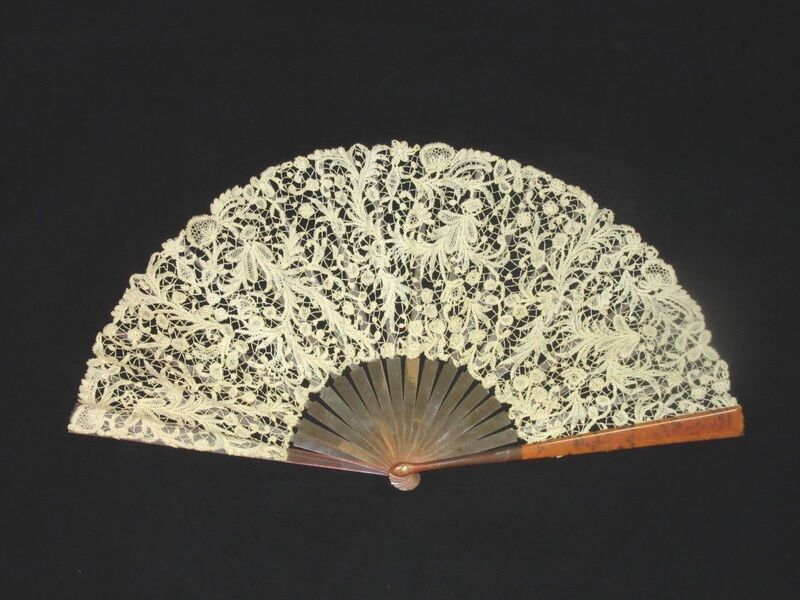 Comments: A Duchesse de Bruges fan with finely inlaid Mother of Pearl sticks. No raised work and the design is very dense – a little chaotic and I can’t see much of a flow to the pattern. Irregular non-picoted brides. Damage: Lace looks OK, one stick needs to be reglued. Soilage: A little localized brown spotting along stick attachments. 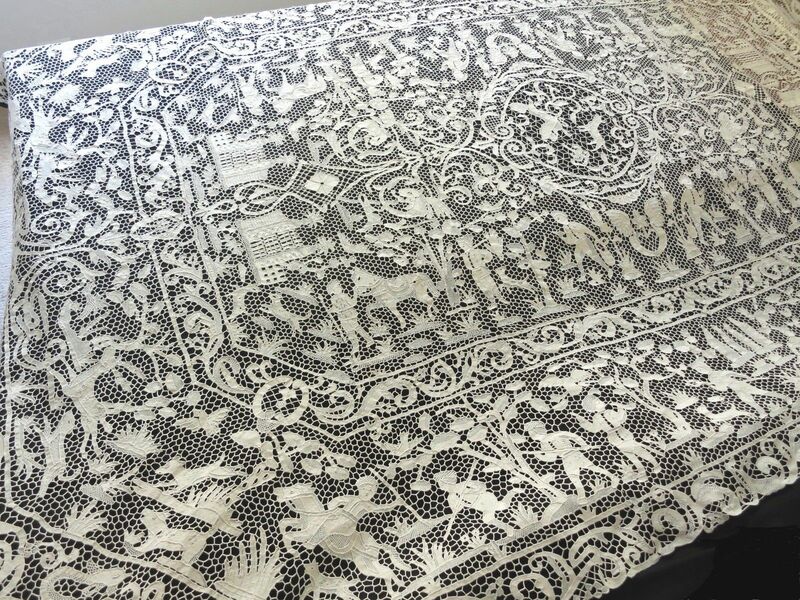 Comments: A deep flounce of Brussels bobbinlace applique on machine net.Needle-made single ring fillings and also grids of needle-made knots used as fillings. I’m not sure how the large area of grid fillings are made along the lower border. The design consists of well executed florals in a fairly simple design. Extensive small esprits in the ground. Modifications: Can’t see the ends to tell if they are cut..
Damage: A few pinholes in the tulle. Finish: Soft vertical and horizontal fold creases. Comments: A Chantilly fan with a Duvelleroy box. The sticks are thin, made of a dark elaborately inlaid Mother of Pearl (the seller calls this Tahitian dark mother of pearl). 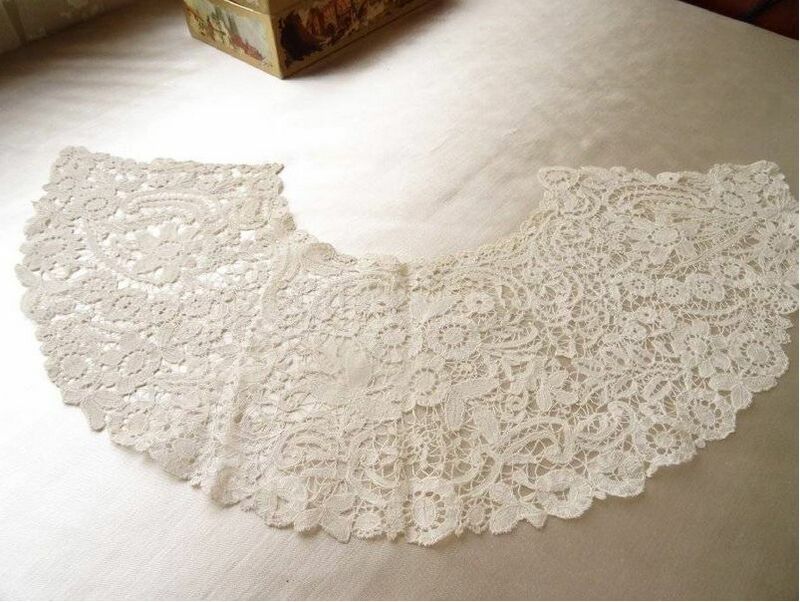 The lace itself is very fine, probably a French product. It has a design of florals sweeping across the leaf. No esprits, no ombre shading. Damage: Some repair to the sticks. Lace looks intact. Sold for 146.90 EUR, 3 bidders. 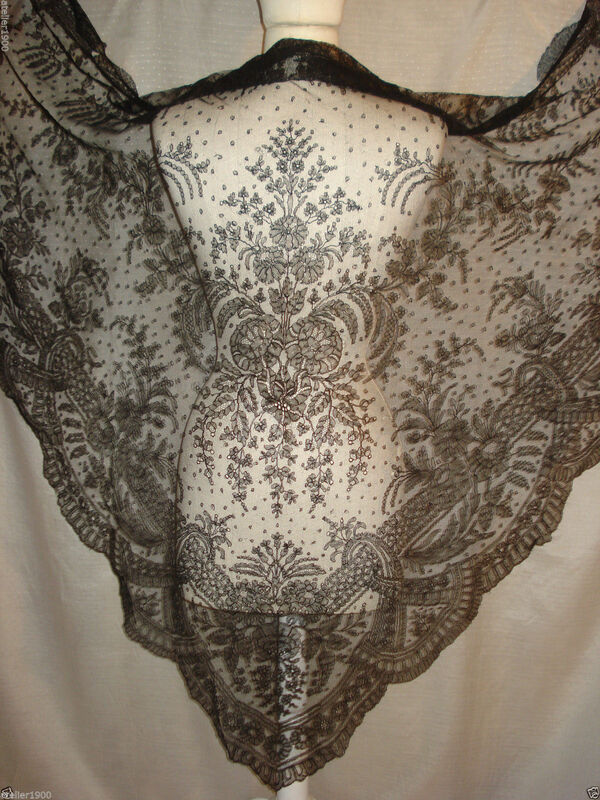 http://tinyurl.com/jkcscwz Marvelous Antique Ladies Black Chantilly Lace Mourning Shawl Scarf Mantilla. Size: Not given. 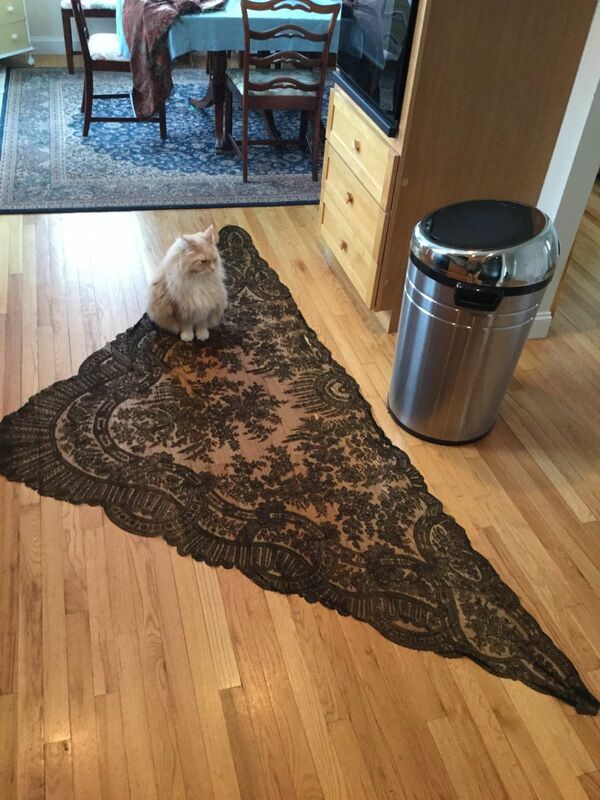 Maybe you can scale the dimensions off the cat. Comments: A Chantilly triangular shawl. I assume the cat does not come with it. The lace is dark black, might be a Belgian product. Typical romantic floral design with lots of strapwork. No esprits, no ombré shading. Damage: Some tears along the top. Might be consistent with cat claws but are probably the result of trying to undo some kind of fastening. Some of these are racroc splits. There are also some pinholes, and a few weaknesses in the halfstitch. Finish: Some creases along the top edge. I must object strongly to the cat sitting on this piece, which probably took 10 women a year to make. We need to respect the lace, the designers, the thread spinners, the marketers, the former owners who ensured its survival, and above all, the women who made it. Sold for $69.09, 7 bidders. 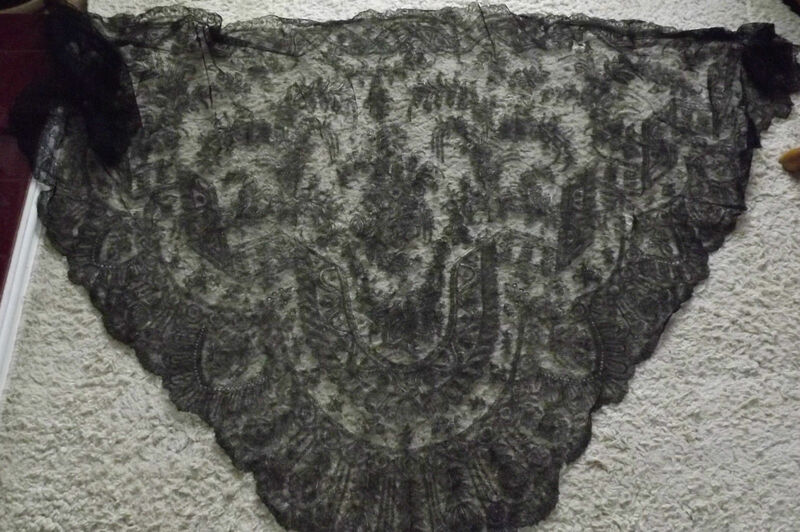 Comments: The third triangular Chantilly shawl this week. 2nd Empire romantic florals with esprits in the ground. Good strapwork along the borders. No ombré shading. Damage: A few small holes and pinholes – not sure if the holes are aligned with racroc. Some loose threads and it looks like a little repair along one edge as shown in the photos. Finish: No large pattern of creases or wrinkles. Comments: A Carrickmacross applique rectangular shawl with a solid provenance. There is a little guipure work at the ends. Good needlerun fillings, and note the raised rings in flower centers. Typical looped picots around the edges. Provenance: Originally work for nuptials of James Galbraith Vermillion (Princeton alum) and Elizabeth Hallock Vermillion, of Newport Rhode Island Sept 10, 1927. It was considered a family heirloom and worn again in 1955, 1986, 1987 and 1999. 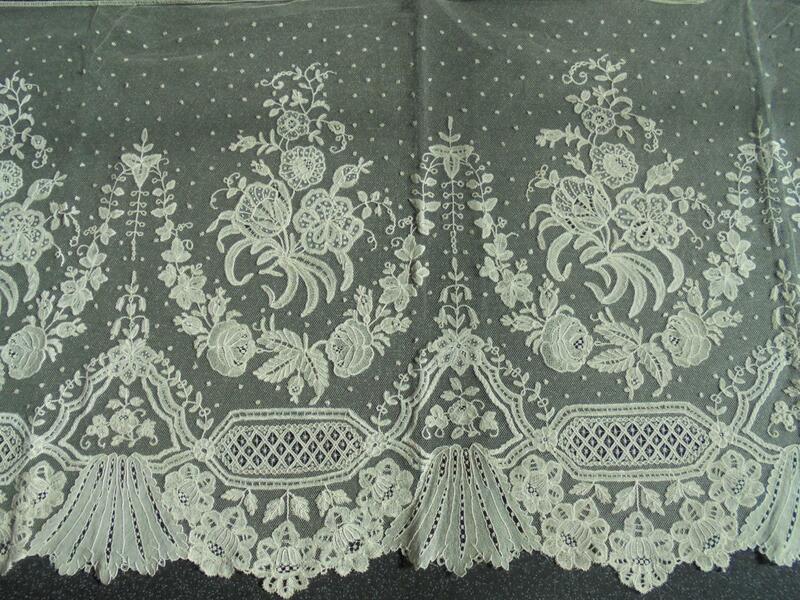 Comes with a slip for 2-3/4 yards of Carrickmacross Irish Lace dated 1918. Modifications: The center part has been slightly gathered to accommodate a headpiece for a bridal veil. Damage: A few small holes and pinholes. Soilage: A few localized brown spots. Finish: A few small creases. Comments: A fan of Rosaline, but it’s an a typical Rosaline design. Not so structured – the design is a bit scattered. It is a bit on the Duchesse side, although the technique is pretty much Rosaline. Including some perls that I think are needle-made. The seller says the sticks are horn. Sold for $200.50, 3 bidders. 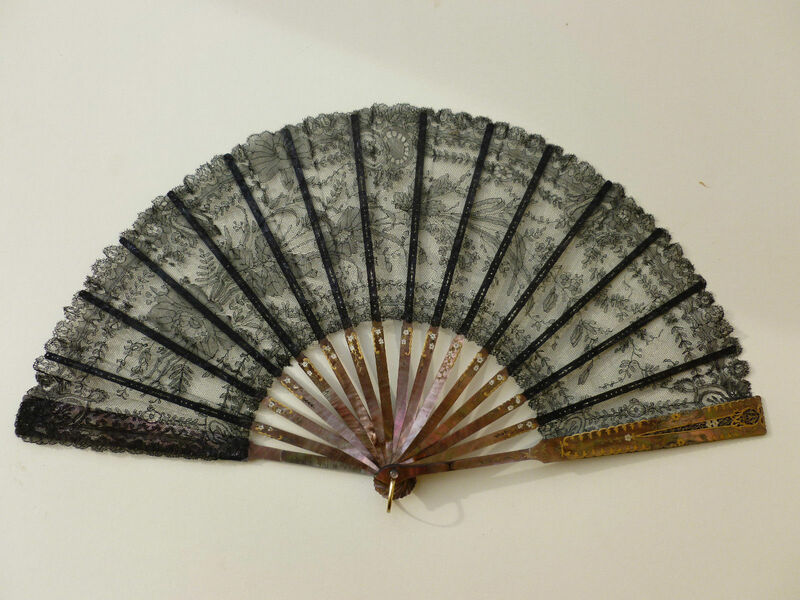 Comments: A Burano needlelace fan with decorated Mother of Perl sticks. The motifs are a little large and simply drawn. Note the grids of rings used as fillings. 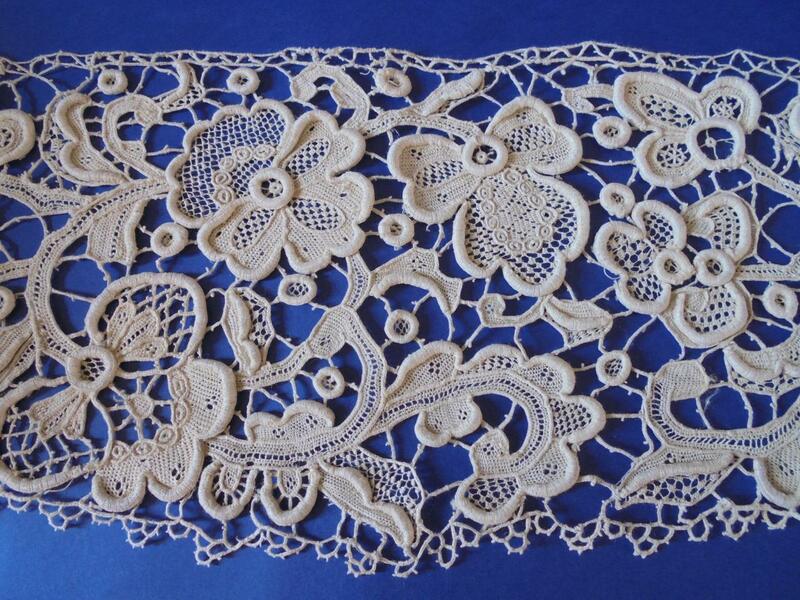 This lace uses cotton thread with the cordonnet buttonholed on. I’ll be devoting one day to Burano technique in my 30 hour Needlelace Practicum course at IOLI this year. Soilage: A little brown staining. Sold for $285.00, 4 bidders.